Trampolines are among the most entertaining toys you can have in your backyard. A good trampoline will provide you and your family with endless amounts of joy, and is both a good way to exercise as well as a great tool to build fundamental athletic skills. Good trampolines come in all shapes and sizes, utilize different spring mechanisms, and can be either in-ground or above-ground. While most of the best trampolines you’ll find out there will be suitable for most people, the options are definitely worth investigating before you jump in and make the investment. The best trampoline for one person may not be the best for another. And while safety is obviously critical, durability, cost, size, shape, and style are also important. So let’s dig a little deeper, check out some trampolines, and see which among them make cut. 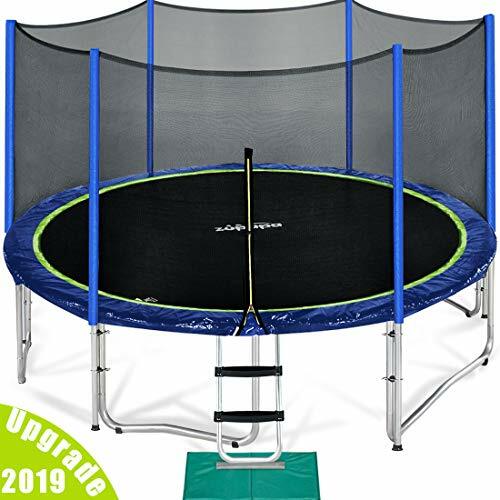 The 2019 newest upgraded Zupapa trampoline with the Safer Unique No-gap Jumping Mat Design, which eliminates gaps between the jump mat and spring pad, makes Zupapa safety higher than TUV standards. The product total weight, box are NOT included, 15FT: 192 lbs. 14FT: 184 lbs. 12FT: 164 lbs. 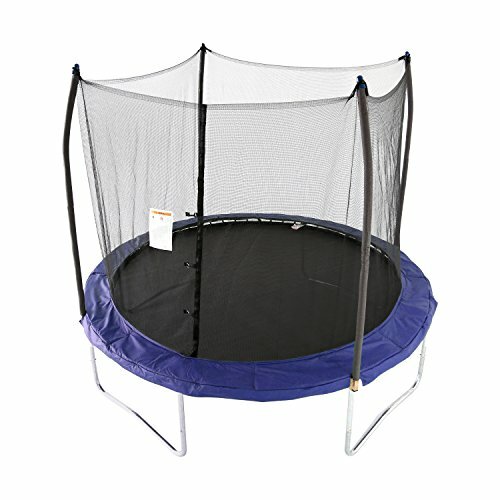 Product total weight is higher than other trampolines. Heavier product weight means more steel is used for strength and durability. All Zupapa trampolines get TUV certified. TUV Report Reference No. for Zupapa: 70.300.13.544.01-01. Which is more authoritative and totally different from some trampolines declared TUV tested. The new Zupapa Trampoline employs upgraded techniques and technology to make products have a longer life. Hot-dip galvanizing process makes the Zupapa trampoline frame and net pole last for decades. UV absorber uv-9 was added to material, pad, mat and net, extend the trial life to two years.  Note: Brandline is the Zupapa Official Authorized Seller, When you place order please make sure it is sold by Brandline. Any half-decent parent should do their due diligence before buying a trampoline. And when it comes to mitigating risks, Zupapa is without question one of the safest trampolines you can purchase. The first thing you’ll likely notice about the Zupapa trampoline is its sturdiness. Each one comes with six galvanized, weather resistant, wind steaks. These solid steel steaks secure the trampoline to the ground, similar to the way tent stakes work. Simply insert them over the base poles and into the ground. They are especially handy in windy areas, where strong gales commonly turn trampolines into kites. In addition to being ground mountable, the safety net on Zupapa trampolines is also a testament to the system’s sturdiness. The net uses way longer net poles than are used by other brands. So long, in fact, that they actually reach all the way to the ground to help stabilize the unit. The net poles are attached to the trampoline legs in two places, making the entire system a lot safer, firmer, and less prone to structural twisting. Most things that are sturdy are also durable, and the Zupapa trampoline is no exception. The frame and net poles are protected using a process called hot-dip galvanization, which uses heated and negatively charged ions to electroplate the steel with a zinc coating, making it rust proof and corrosion resistant. The spring padding, bounce surface, and safety net are also upgraded to stand the tests of time, incorporating a UV absorber called uv-9 to protect them from the damaging radiation emitted by the sun. And for those cold, rainy, or snowy seasons, the trampoline comes with a protective cover to extend its life even further! Safety and durability are crucial, but if you can’t put the thing together, it will end up gathering dust in your garage. This is yet another reason why we like this trampoline. It comes with detailed assembly instructions, and there are countless videos available online that go step-by-step through the process of setting it up. If you’ve ever put a trampoline together before, you’ll be happy to hear that the kit comes with two pairs of gloves as well as s T Spring Pull Tool to protect your hands and help you connect the springs to the frame and jump surface! Skywalker made our list because of its proven durability and safety standards, bringing the fun while mitigating risks. Coming with the option of a blue, green or red spring pad, this 10′ trampoline is great for all ages and weights. Its compact size fits smaller yards and play areas, but don’t let that fool you, this trampoline is tough as nails. It’s frame and net poles are built from heavy gauged steel, and its 64 tightly-coiled springs won’t rust or corrode due to adverse weather conditions. The extra-wide, UV-resistant frame pad is one inch thick, adding extra padding, safety, and comfort. You can really tell a product’s quality by the warranty that the manufacturers provide. For this trampoline, Skywalker offers a three-year warranty for the frame, and a one-year warranty for the other parts. This is above and beyond what many trampoline makers provide, and a telltale sign of the confidence they have in the material and construction of their products. On top of their durable design, Skywalker is also a staunch proponent of safety. If you’ve ever bounced on older trampolines, you’ve likely experienced an incident involving the gap between the bounce surface and the springs. Being pinched by a retracting spring or having one leg go through the gap between the bounce surface and the frame is never fun. That is why Skywalker developed and patented their no-gap enclosure design, which eliminates that dangerous space where injuries commonly occur. Their net design wraps around the perimeter of the jump surface, attaching to each and every spring to prevent pinch points and openings. In addition to their proprietary net design, they also use angled, capped, and padded poles as well as a dual net closure system — which incorporates both latches and zippers to insure that the opening can close nice and tight. As a proud member of the American Society for Testing and Materials (ASTM), each of Skywalker’s product lines undergo rigorous tests for safety and durability to ensure that they comply with the highest of standards. These tests are’t required by law, so it’s good to know that they conduct them voluntarily — a true sign of corporate ethics that puts quality over profits. Unlike the first two trampolines we looked at, Happy Trampoline’s Galactic Xtreme unit is built in the shape of a rectangle. And because of its thick frame, it has a weight limit capacity of 550 pounds! Like Skywalker, Happy Trampoline subjects their products to strict testing and quality controls — and they stand behind their products with a lifetime warranty on the frame and springs, which are galvanized both inside and out. The trampoline frame is constructed from commercial grade steel, and at three millimeters, it is the thickest in the industry. Although anyone can have fun on this trampoline, regardless of age or ability, it is more geared toward elite jumpers who are looking for extra bounce and increased air time. Using up to 156 extra long 9” springs and a non-abrasive polypropylene jumping mat, Happy Trampoline offers some of the softest landings available. If you’re looking for a trampoline to practice aerial flips, twists, and twirls, this is a great option. This trampoline is common in the gymnastics, diving, cheer, and extreme sports communities. The rebound is powerful, and the more force that is exerted downward, the more bounce there will be on the rebound. Many people also prefer the rectangular shape, claiming that it’s easier for them to execute their moves on. This could be the case, or it could just be because the trampoline has a large surface area — the biggest option being ten feet wide by twenty-three feet long. The unit’s ladder is pitched at an angle, making accents and descents easy as can be. Its safety net is made from a high-grade polyester mesh, and is securely locked in place by the interconnecting frame. It is shock absorbing and padded, able to flex on impact to dissipate force and reduce harm to both users and the trampoline itself. All in all this is a great trampoline. Perhaps a little overkill for the casual bouncer, but a great option for the passionate few among us who settle for nothing but the best. Like its name would suggest, the trampolines by Springfree are, well… spring free. Instead of generating bounce from numerous springs in flexion, Springfree trampolines use composite fiberglass rods to harness and unleash the user’s gravitational energy. 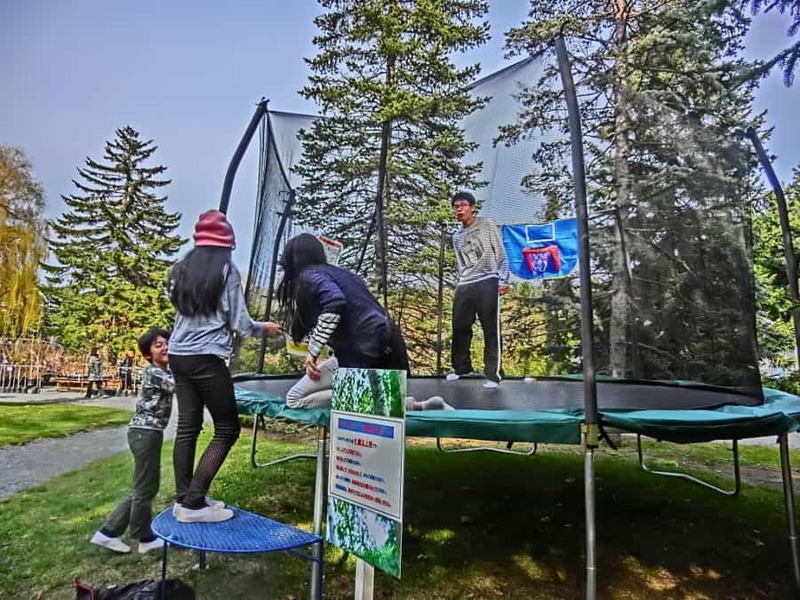 As the self-proclaimed “world’s safest trampoline”, the design has no hard edges, a flexible enclosure and frame that makes it impossible to fall off, and a springless design that won’t pinch or snap. All parts of this tramp are under a ten-year warranty, and upon investigation, it’s not hard to see why. The metal components are double powder coated and galvanized, and the nets and mats are constructed using UV resistant polypropylene. It can withstand up to 1,100 pounds of structural load, with a weight rating of 220 pounds per jumper. Included in the purchase is a FlexrStep ladder, a FlexrHoop basketball hoop, and a Digital Game System that you can plug your phone into — perfect for endless fun, games, and entertainment. Although the smaller models don’t provide as much bounce as a spring-powered trampoline, the larger ones are practically identical in terms of “bounceability”. The biggest difference is double bouncing, which isn’t quite as effective as it is on traditional spring trampolines. If you construct the unit yourself, be prepared to put in some time — two hours minimum. And because it is quite heavy, be sure to install it right where you want it, as it will be difficult to move to a new location within your yard. YouTube instructional videos will be your friend here. Watch them through and through before you tackle the assembly process. Of particular note, make sure that you attach the net before you install the mats. I you try the reverse you will become extremely frustrated. As one of the cheaper options, the twelve-foot Merax trampoline is the perfect choice for those looking for a quality trampoline on a fixed, limited budget. This is a great unit for younger children and those who don’t want or need all the extra pizazz. Don’t let the low price be indicative of quality though, as this trampoline is still super safe and functional. The jumping mat is a polypropylene mesh, the padding on the perimeter is made from durable and waterproof polyethylene, and the 72 springs are fabricated out of galvanized steel. In terms of setup, this one is among the simplest. The rust-resistant steel frame attaches to six W-shaped legs which stabilize the trampoline during use. It’s UV-proof safety enclosure attaches to the frame in two places, and although it is a little less sturdy than the other options we’ve looked at, it’s more than safe for youngsters — perhaps, however, not capable of withstanding prolonged pressure and impact from rambunctious adults. The weight capacity is 330 pounds, which is in line with similar trampolines at higher price-points. It comes with an inclined ladder for easy entry and exit, and includes a basketball hoop for all the aspiring dunk masters out there. Definitely a great buy for the value. Cheap yet high quality. The best trampoline for your needs will depend on several factors. Obviously, budget is important. But long term value is often of greater importance, as investing in the right trampoline from the start can save you from having to make costly repairs and expensive replacements down the line. Space can also be a limitation, and to a lesser degree, your local climate and weather conditions. An appropriate trampoline can make all the difference. After all, you wouldn’t want to spend extra money for features that are useless to you. Or vice versa go the cheaper route only to realize that you need something bigger, better, bouncier or burlyer. We’ll discuss the issue further, attempting to zero in on some key differences between trampolines, identify a few common issues to look out for, and provide a variety of tips and tricks that can help you and your family stay safe while enjoying your trampoline. In-ground trampolines are very discrete. Unlike conventional trampolines, they preserve the presentation and aesthetics of an outdoor space. If you think that a trampoline may be unsightly and detract from the overall look or feel of your yard, the low profile of an in-ground trampoline will seamlessly blend with its surroundings, being almost imperceptible from afar. In-ground systems are often considered to be safer than their above-ground counterparts. Because they are at ground level, the risk of falling off is non-existent. Ergo, there is no need for a safety net, which is definitely a must-have accessory for above-ground units. In addition to safety, in-ground versions are more accessible, and don’t require ladders, step stools, or climbing in any way to get on. This can bring peace of mind to cautious parents, because even with a safety net, if a child falls before entering an above-ground trampoline, he/she is still liable to become injured. In general, less maintenance is required for an in-ground trampoline, which has no metal legs and can be easily covered when not in use. As they are firmly affixed in the ground, they won’t blow away in heavy winds, and don’t require any tie-downs or straps. Finally, in-ground trampoline systems are much more difficult to steal. Although trampoline theft is uncommon, it has happened in the past and will surely continue as long as there are thieves lurking among us. If you plan on moving soon or are the type of person who changes their mind frequently, the in-ground trampoline type may not be the best option for you. They are hard to move, making it difficult to bring along should you relocate, and troublesome if you want to rearrange your yard. Once an in-ground trampoline is in place, for all intents and purposes, that is where it will stay. Proper airflow must be ensured so that the trampoline maintains the expected levels of bounce. If air is stuck underneath, it will restrict the bounce of the jumping surface, making it harder and more rigid. Like proper airflow, waterflow is also important. If you don’t have proper drainage, your in-ground trampoline will turn into an in-ground pool. Furthermore, standing water will make the metal components of your in-ground pool rust easier, so it is advised that you either bury the metal frame, cover it with sod, or put some kind of plastic or rubber covering over it. Last but certainly not least, in-ground trampoline systems require a large hole underneath them, which can be hard to dig even with the help of tractors and machines. Before you dig anything, make sure to contact your local gas, electric, and water companies to make sure that your planned digging area is free from water pipes, gas lines, and electric cables. What’s the Deal With the Weight Limits? Just like any product, the weight limits of a trampoline stem from the capabilities of their constituent components. As you might expect, higher quality components can hold more weight, but they are also more expensive. If you choose a trampoline that doesn’t meet your weight requirements, it will wear down faster and the safety features won’t be as safe. So choosing a trampoline that can handle the weight you throw at it is super important. In the same regard, purchasing a model with a high weight capacity may not solve all of your problems either. The first thing you must look at are the springs. If they are smaller, more easily bent, and easier to elongate, then the trampoline will likely be rated for less weight. Contrastly, springs designed for professional use in gyms, performance acts, and commercial bounce houses typically use stronger springs that are more rigid and require greater force to extend. You should also have a look at where the springs attach to the jumping plane. If the loops or rings have a large diameter and are double or even triple stitched, then you know that the trampoline is built to take a good deal of weight. Here’s a helpful video that investigates the weight limit of a Springfree trampoline — the fourth trampoline we discussed in the section above. Regardless of which trampoline you have, there are a few universal tips and tricks that will keep you and your loved ones safe, happy, and able to bounce another day. If you were a bit stingy with your trampoline, it may be wise to invest in additional padding. Buying an aftermarket spring pad or putting swimming noodles around the bars of the safety net will add cost, but its far cheaper than a trip to the emergency room. In an ideal world, you should only allow one jumper at a time. This will reduce the chances of collisions — keeping knees away from teeth and elbows away from eye sockets. In reality, however, this rule kind of defeats the purpose of having a trampoline in the first place. But it’s good to keep in mind that, in general, contact injuries and the number of individuals on a trampoline at any given time are directly proportional. Close and secure the entrance of the safety enclosure! Why spend all that money on a safety net if you’re going to leave the entrance/exit open? You may think the probability of falling out of the opening is slim, but why take that chance? Zip it, clamp it, fasten it, do whatever is necessary to make sure that succer is tight and secure. Prepare your body before you jump. Like any high-intensity exercise, it is important to stretch and warm up before you begin bouncing. This will get your muscles and joints ready for action, and loosen everything up to avoid sprains, pulls, cramps and other injuries. Don’t do flips or summersaults! Ok, ok, I know that’s no fun and you may disregard this last one, so if you do decide to step up and attempt an areal trick, make sure there is someone there to watch you in case you mess up. Remember that commitment is key. If you are going to do a backflip, don’t hesitate half way through and fall on your neck. Have confidence and execute, take baby steps, and make sure to never attempt anything too far beyond your skill level. In a lot of instances, instruction manuals are tricky at best, and seemingly impossible at worst. But don’t fear, for every trampoline, there is a YouTube hero out there that will show you how to put it together. Most trampolines don’t require any special tools, just a socket set, a screwdriver, and the willingness to get er’ done. Call your friendly neighbor or get a family member to help out, because constructing a trampoline alone can be slightly daunting. You can call a handyman to help, but this is often expensive and unnecessary. In terms of location, you should try to find level ground with ample space underneath, because bottoming out can be quite the downer. If your yard has grass or sod, mowing will become a bit more difficult around and under your trampoline. You will also find that the grass underneath may be affected due to a lack of sunlight, and will tend to wilt or even die. But as they say, you gotta pay to play! Zupapa is a German firm and an industry leader in the trampoline sector, supplying top-quality trampolines to customers around the globe. There are an estimated 120,000 Zupapa trampolines currently in use, and to reach their goal of making the trampoline a part of the daily lives of every suburban family, they are doubling their efforts to upgrade both their product offering and their customer service. Everything they sell is TUV certified and rigorously tested for quality, safety, and durability. They strive to bring active and beneficial toys to a world that is increasingly dominated by digital entertainment and electronic devices. It is their hope to create a safer, funner, and more convenient way to help kids, adults, and families live happier and healthier lives. Happy Trampoline is America’s trampoline specialist, with the biggest Trampoline Superstore in the country. They are proudly US-Based, having operated out of California since their inception in 1996. They offer the most comprehensive trampoline lines, ranging from the octagonal models to their giant 16ft round behemoths. With products that go through strict quality controls and either meet or exceed current safety regulations set forth by institutions like ASTM and TUV, Happy Trampoline offers the longest warranties in the game, and have a 110% price match guarantee. Under the slogan “Engineered For Safety. Built to Last”, Springfree has led the industry in terms of innovation. Their products are sold in over twenty-five countries, with over 300 employees led by the charismatic Dr. Keith Alexander — who set out with a mission to reengineer the trampoline to eliminate the majority of impact areas that cause injuries. At Springfree, a dedication to safety and producing the highest quality product is a driving force behind everything they do — with every unit built and tested in-house before being shipped to the consumer. Q: Which trampolines are the bounciest? A: The height you’ll be able to reach on any given trampoline depends on various factors, such as how heavy you are, the weather conditions, your own leg strength, and whether or not you’re getting double bounced. The AlleyOOP Double Bounce is commonly cited as the trampoline that will give you the highest bounce. However, the Skywalker Jump N’ Dunk and the Gigantex Trampoline Combo Bounce are also notoriously bouncy. There are even bouncier trampolines out there, but they are either homemade or custom built for specialty purposes. Q: What makes a trampoline bouncy? A: In short, the springs and the mat. When a downward force is applied to a trampoline, the mat and springs become stretched and extended. Once the downward force is no longer strong enough to maintain the motion in a downward direction, the springs and mat snap back, shooting whatever is above up into the air. Professional trampolines typically use woven nylon for the mat material, but most home trampolines use polypropylene because it is much cheaper. Some “tramp hackers” promote crossing the springs to increase the bounce of a trampoline. While this does increase the bounce, it is terrible for the springs, creating friction, shortening their lifespan, and increasing the risk of them snapping and hitting the user. Q: Are trampolines with more springs more bouncy? A: Yes and No. Although the more springs a trampoline has the bouncier it will be in general, more important is the length of the springs. The longer the spring is, the more power it has to recoil back to its original position, which exerts more upward force on the trampoline mat (and the person or thing on it). When you boil things down and get to the crux of what makes a good trampoline, you find that it all depends on your needs. If you’re an extreme jumper and want to constantly push yourself to the limits, a rig from Happy Trampoline won’t let you down. True they are more expensive than the competition. But if you take price as an indicator of value — which you shouldn’t always do, but in this situation it’s applicable — then they are leaps and bounds ahead of the other guys. They have the sturdiest build, a large bounce area to give you room to properly execute your jumps, and have a strong safety net so you won’t fall off the side. This is a great way to master techniques before you try them out in other arenas. Professional snowboarders, bikers, and skateboarders all master their motions on trampolines first before trying them on their respective “vehicles”. If the Happy Trampoline systems are a little too expensive for you, Zupapa is definitely the way to go then. Their elongated safety net poles make the system impressively stable, while the included stakes keep it tight and secure to the ground. It won’t blow away in high winds, and will hold strong regardless of how hard you bounce. The price is reasonable, the safety mechanisms are on point, and the quality is high. The only thing that’s missing is you! Looking for other backyard games and activities besides trampolines?